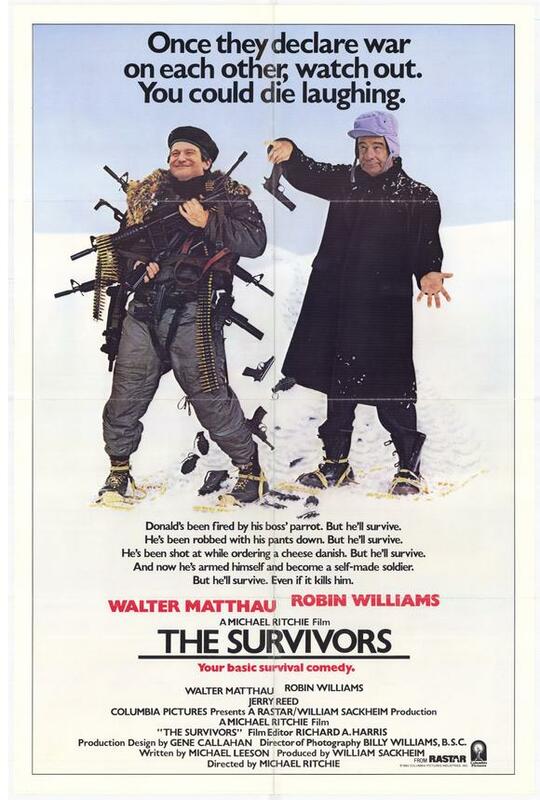 Sonny (Walter Matthau) and Donald (Robin Williams) are a mismatched pair who inadvertently become involved with bad guy Jack (Jerry Reed) after witnessing him holding up a restaurant. Donald seeks protection by joining a radical militia group while Sonny chases after him in an attempt to get him out of it. The story certainly has the foundation for good potent satire. It hits on the serious issue of average citizen vigilantes who become more fanatical and dangerous than the criminals themselves. It peaks with a scene in a gun shop were a little old lady packs herself with some really big guns. Unfortunately it becomes soft and aimless after that and the result is a clumsy comedy with too much nonsense thrown in for cheap laughs. There is also too many shifts in allegiances here, which makes it all implausible. First Donald is on the run from Jack and even tells him off in a funny moment over the telephone. Then before you know it they are working together and going against the fanatical militia group that at one time Donald was really into. The final denouncement involving the true allegiance of the militia group’s leader is also absurd. There are some good laughs, but they are scattered haphazardly throughout. The best stuff comes from Williams. He seems a little out of place at first playing the part of the henpecked businessman, but he quickly comes into his own. His shootout with Reed is the real topper and Matthau is as always consistently amusing. The female cast is also interesting. Kristen Vigard is a nice addition as Matthau’s teen daughter. She is pretty and smart, but still quite sweet. Her relaxed and casual responses to things are a nice contrast to the frantic behaving adults. Annie McEnroe as Williams’ wife is also good only because of her facial expressions which never allow you to know what she is really thinking or feeling. This entry was posted in 80's Movies, Action/Adventure, Buddy Movies, Cold Climate/Wintertime Movies, Satire and tagged Annie McEnroe, Entertainment, Jerry Reed, Kristen Vigard, Movies, Review, Robin Williams, Walter Matthau. Bookmark the permalink.